I’m at work and it feels like a VACATION! My 5 year old had fever and a sore throat on Thursday morning, so I kept him and his 4 year old sister home. He convinced me that he was still not feeling perky enough for kindergarten on Friday, so we took another ‘sick’ day. And then there was the full weekend of a kid’s birthday party on Saturday and pumpkin painting/carving on Sunday. I am finally back at work today and it feels like a wonderful vacation! I can sit alone with my own thoughts for stretches of time, drink my Coke in peace, type on a computer that hasn’t been converted against my knowledge to Windows 8 (another story for another day), and basically be myself again. I love my kids and would do anything for them, but I do NOT know how moms who stay at home with theirs do it. I didn’t even have time to quilt on those two days. I did, however, get back into a groove during the weekend and made some progress. 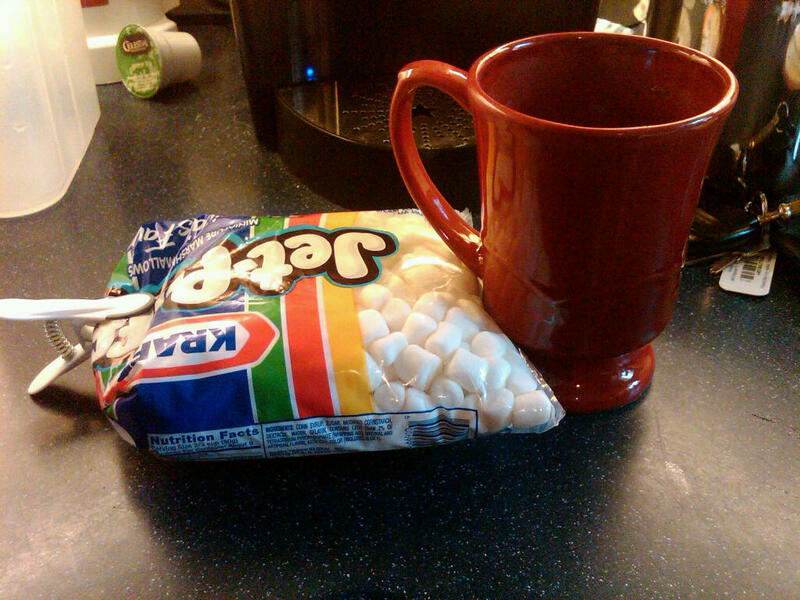 I like to make mine with as many mini-marshmallows as hot chocolate and it is super yummy and satisfying! I was also able to finally finish my first block of the Away From Home BOM, using the Mill Girls fabric collection by Judie Rothermel. 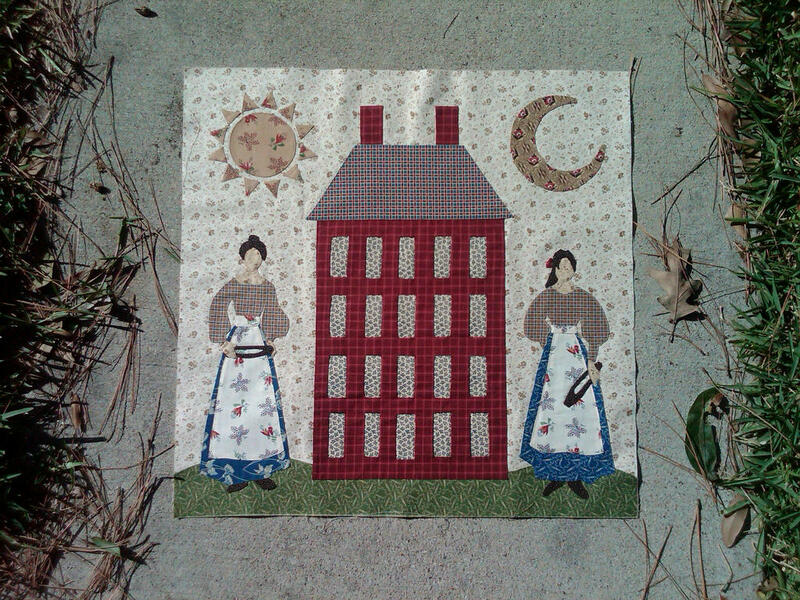 Away From Home Block 1 – Done!! Honestly, I am so glad to get this block done so I can move on to the next one. I’m so excited to work with this fabric and I am ready to have a chance to cut up some more and play with other selections. 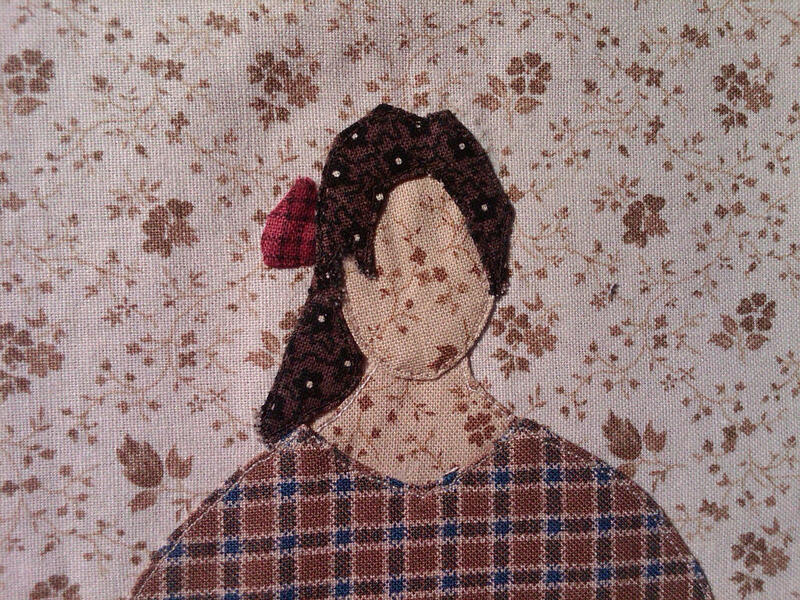 I did have a problem with getting the hair just right on the second mill girl in the picture (on the right). I don’t know how anyone is suppose to do those tight little curves and cut-outs, but my first attempt ended with my trying to use a Sharpie marker to color in some areas, but then it smeared onto the face fabric. Blech! So, I tried again, this time cutting out the top hair section in one piece, instead of two and top-stitching it down by machine instead of by hand. It is good enough to leave in – I’m moving on! But not before I link up to Sinta’s BOM Rehab! I did get started on Block 2, which amazes me. I have about another week before Block 3 shows up in my mailbox. I really love these bright colors with the reproduction fabric feel. Everything as of this morning is cut out except for the large scroll heart. I have the freezer paper template made, but I’m still trimming it down before I press it to the fabric. That one will take awhile to starch outline, but I should get it done this week. Well, it has been too long since my last post. 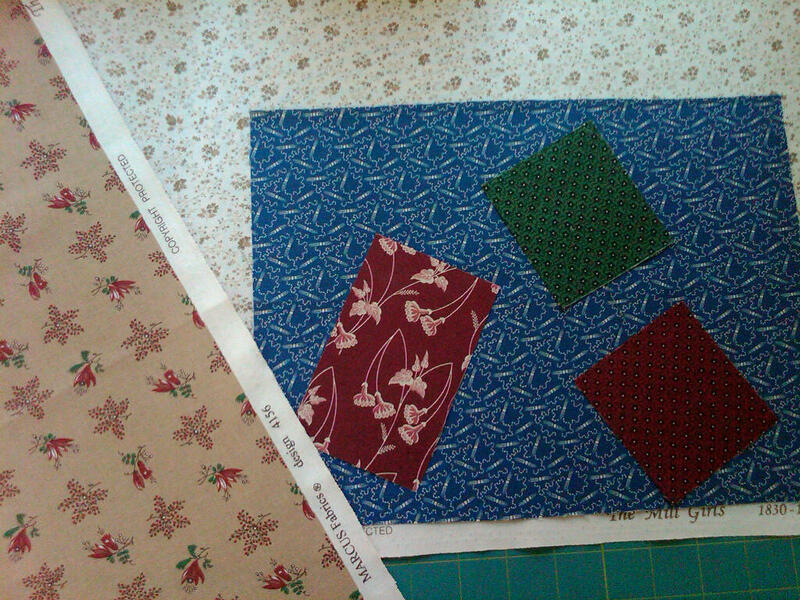 I actually finished and then started FMQ my Forget Me Not quilt, done using the blocks from Pam Buda’s sew along. I added my own pieced inner border and a solid outer border from my left over scraps in her kit. I was trying to get it completed for my mom’s birthday last week, but I couldn’t quite get it finished. 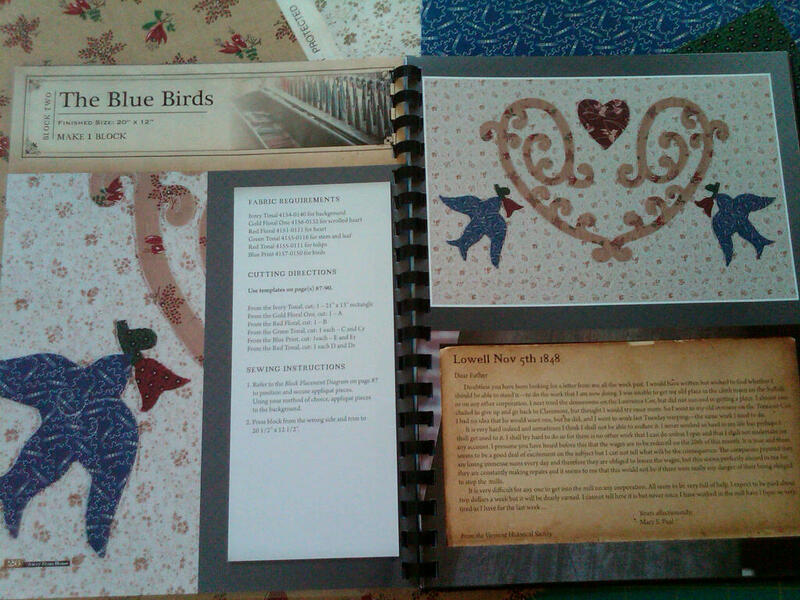 I just have the outer ‘solid’ border to quilt and then bind it up. I’ll share my results in another post this week when it is done. Thinking hard about going to the Quilt Show in Houston this weekend. Perhaps talking my mom into going with me. I only live 10 minutes from the convention center, so it would be ridiculous if I didn’t go – right? Really wish I could have sneaked into the Quilt Market days with all of the wonderful designers and fabric companies. It would be a real thrill to meet some of them, like Kristyne! Hope all have a wonderful, wonderful day! 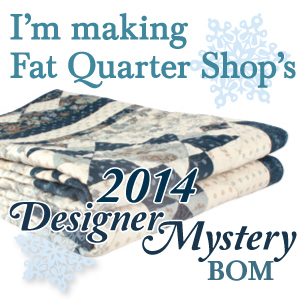 ← Weight Loss through Quilting! Hi Jennifer! Thanks for adding me to your blog roll. It led me to your blog, which I love. I’ve added it to my favorites. Question about the Away from Home block: how did you applique the rays of the sun? Your applique looks great!! Hi Dawn! Thanks for the compliment, I didn’t realize blogmasters were notified when I added their URLs, but I’m glad it did. I do enjoy your blog and have been following it for a good while now. The sun ray applique were just starch method and some burned fingers pressing down the sides and trimming the overlap carefully. For most all of my applique, I have just used a glue stick and then stitched really close to the edge with my machine. I appreciate your comments!